I have a two year old niece. She’s great. Really great. She can count up to thirty by herself. She knows her all of her ABCs and colors. She LOVES eating vegetables. She’ll eat fresh picked green beans like they’re potato chips. Broccoli? Brussel Sprouts? Cucumbers? No problem. She’ll eat them with a smile on her face. She sings the “Farmer in the Dell” as the “Farmer in the Cheese”. I don’t know why, but it’s friggin adorable. I videotaped it. I watch it often whenever I need a smile. She is an expert at working a cellphone and a tablet. I’m serious: this 2 year old knows how to find contacts and dial/Facetime numbers, surf Youtube, find the cartoon videos she likes, skip the ads, rewind/fast forward and repeat the videos over again. It’s CRAZY how tech savvy she is. All I know is, I’m a mighty proud auntie. I mean, she’s two: so that means that she does love Cheetos, apple juice, and ice cream. She doesn’t like going to bed at night. And hearing the word ‘No’ sometimes makes her….upset. But regardless of those trying times that come with living with a toddler, I gotta say that my niece is one of the biggest lights of my life and I’m so glad that I get to help raise her and watch her grow. Even if I never have any kids of my own, she’ll always be my baby. Come to think of it, I just remembered something. Something important. I know what you guys are all thinking. Well, today’s a pretty special occasion guys. So I baked a pretty special cake. Today’s the second anniversary of Cooking is My Sport. I’ve been both an aunt AND a food blogger for two years now and although being an aunt always takes precedence for me, I will say that being a blogger’s been a pretty great part of my life too. It’s given me the opportunity to share what I love to do with a whole bunch of friends, strangers, and strangers who have become friends. It’s also one of the better decisions I’ve made and I couldn’t let the day go by without whipping up something great to commemorate the occasion. And God, is this thing great. Let me tell you guys something. 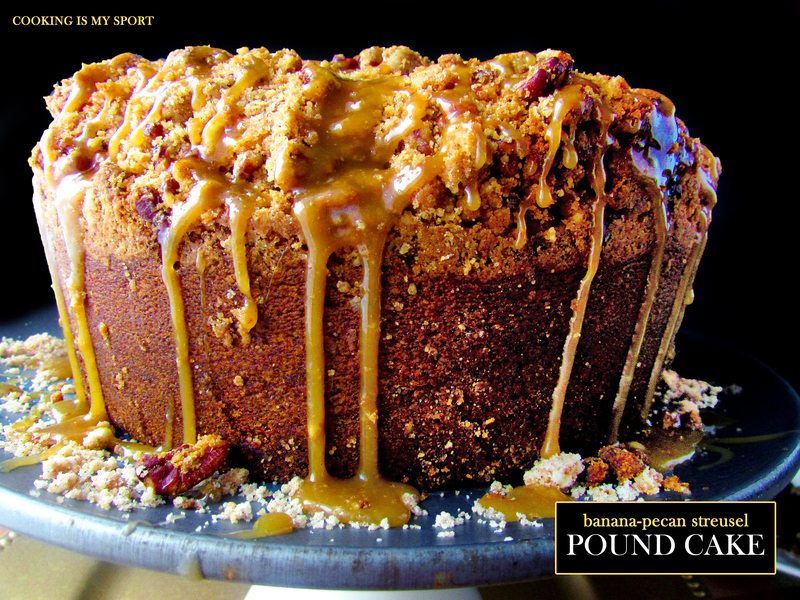 There’s pound cake….and then there’s POUND CAKE. Those who know what’s up, can tell the difference. You guys should know how serious I was about celebrating my blogs second birthday. 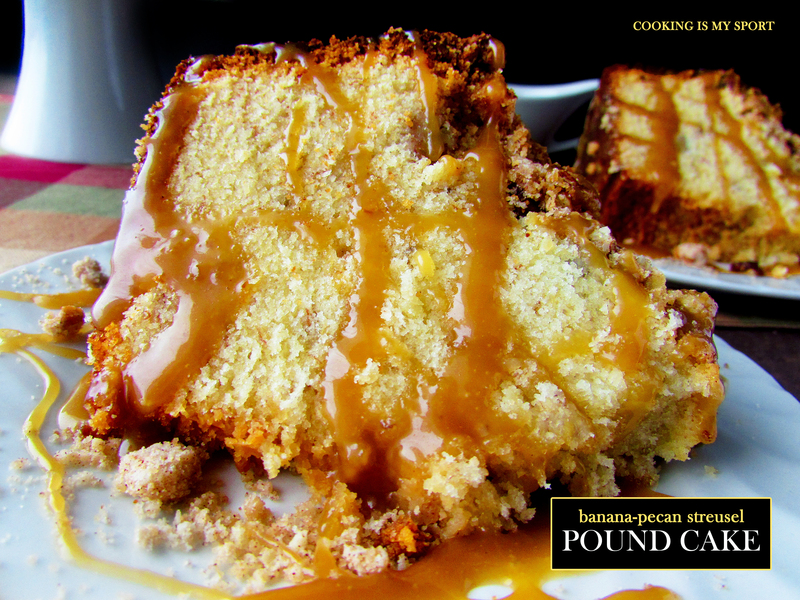 This recipe was originally, just for a plain banana pound cake with pecans sprinkled on top. But that wasn’t good enough for me. I wanted more. 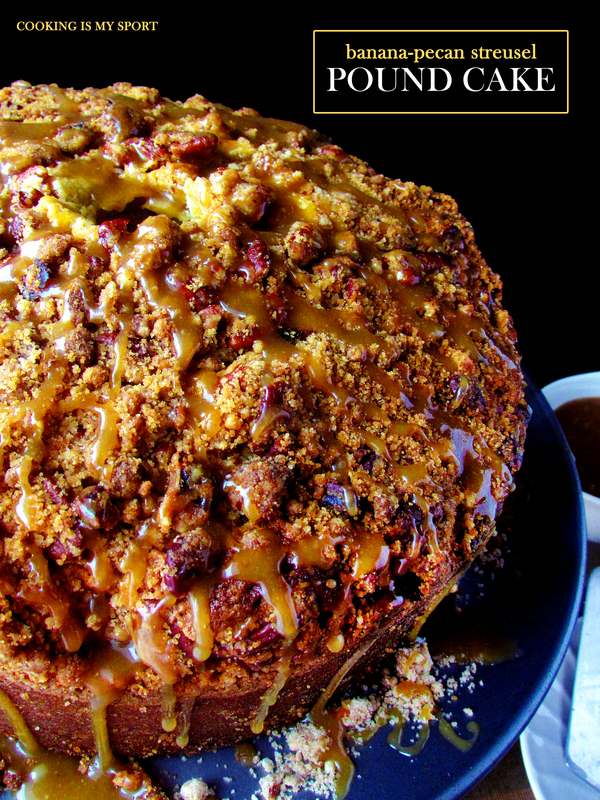 So not only did I add a buttery pecan streusel topping to this ginormous cake, I went a step further and made a caramel sauce from scratch to drizzle on top of the finished product. 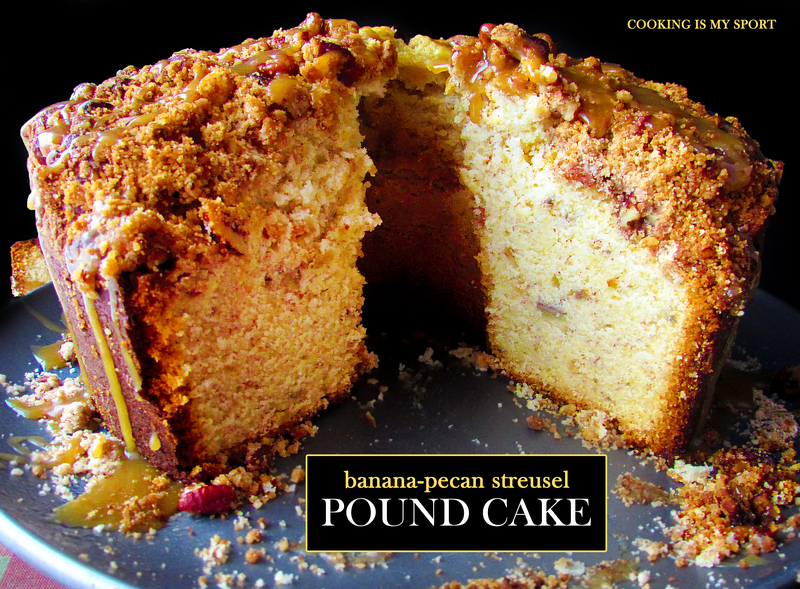 I took an ordinary pound cake, and brought it up to…a higher level. It’s just what I do. And I’m also feeling rather generous, so to celebrate Cooking is My Sport’s birthday, I’d like to invite all of you to take one great big slice of this cake. Eat, get your mind blown, and smile. Preheat oven to 350 degrees Fahrenheit. Beat butter at medium speed with an electric mixer about 2 minutes or until creamy. Gradually add sugar, beating 5 to 7 minutes. Add eggs, 1 at a time, beating just until yellow disappears after each addition. 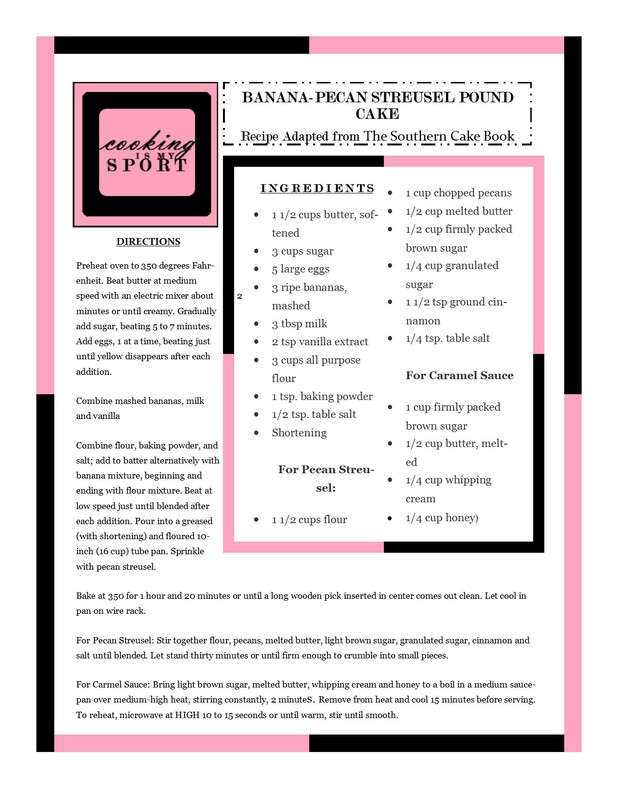 Combine flour, baking powder, and salt; add to batter alternatively with banana mixture, beginning and ending with flour mixture. Beat at low speed just until blended after each addition. Pour into a greased (with shortening) and floured 10-inch (16 cup) tube pan. Sprinkle with pecan streusel. Bake at 350 for 1 hour and 20 minutes or until a long wooden pick inserted in center comes out clean. Let cool in pan on wire rack. For Pecan Streusel: Stir together flour, pecans, melted butter, light brown sugar, granulated sugar, cinnamon and salt until blended. Let stand thirty minutes or until firm enough to crumble into small pieces. For Carmel Sauce: Bring light brown sugar, melted butter, whipping cream and honey to a boil in a medium saucepsn over medium-high heat, stirring constantly, 2 minutes. Remove from heat and cool 15 minutes before serving. To reheat, microwave at HIGH 10 to 15 seconds or until warm, stir until smooth. Looks so decadent and inviting! Love pecans! Happy 2nd Blogversary! And DANG that cake looks GOOD!! Oh trust me, it tastes just as good as it looks lol Thank you! Love this post. 🙂 Congrats on your blog birthday!! This looks amazing!! Happy Anniversary! I adore your blog! Congratulations on your blog anniversary, Jess! What a perfect cake to celebrate. I love that it has streusel and caramel sauce. I really enjoy your blog and am glad you started it! Congrats! Happy blogiversary! Looks wickedly sinfully delicious. That’s a perfect description for it Gretchen lol, thank you! Congratulations on your anniversary! This cake blows my mind. That streusel is teasing my tastebuds! Your niece is an amazing little girl. I think that children are so much smarter that we give them credit for. You must provide her a great environment that allows her excel. Congratulations Jess! And OMG the pics are insane. Whoa!! Amazingly delish! I wish I can dig my spoon into the screen. And your sweet little neice looks like one whiz kid in the making!!! Can I have some for my coffee break right now? 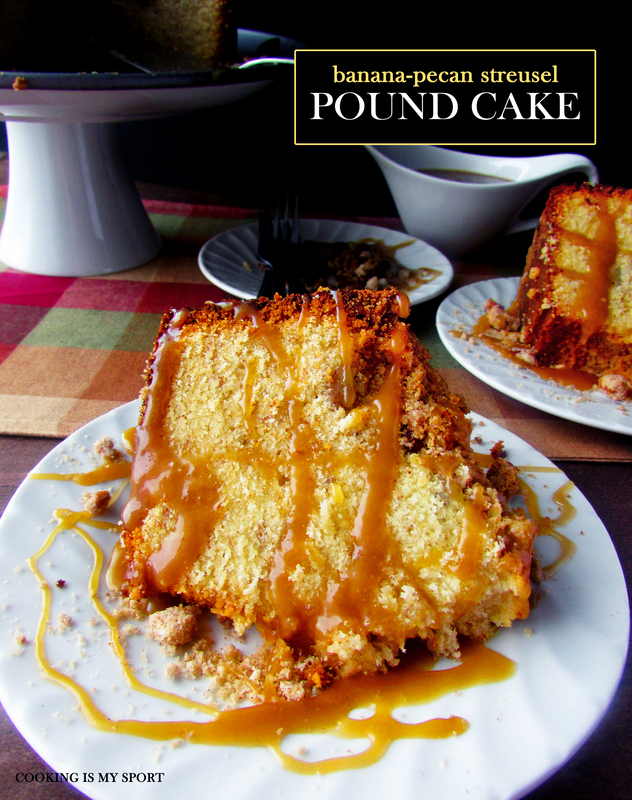 This pound cake looks amazing! And your niece sounds so adorable! 🙂 Congratulations on your 2nd blogaversary, too! I love anything with streusel on top. Yours looks spectacular! Just want to sink my teeth into that piece!